This building was constructed in 1959 originally in two bedroom configurations. Some owners have changed their condos into larger one-bedroom units. Diamond Head Hale has a total of 16 condo residences. Interior size ranges from 685 to 750 square feet. These condos do not have lanais, however they share a large pool and barbecue deck as the centerpiece of the property. Diamond Head Hale is a walk up two-story condo. Maintenance fees are approximately $400 per month. Each unit has an assigned parking stall. Guests can find parking pretty easily on nearby streets. Amenities of the property include a swimming pool and community laundry. Diamond Head Hale is pet friendly, cats and birds are allowed with Board approval. This was originally a co-op building which was recently converted to condo. It's easier to get a mortgage loan for a condo compared with co-ops. 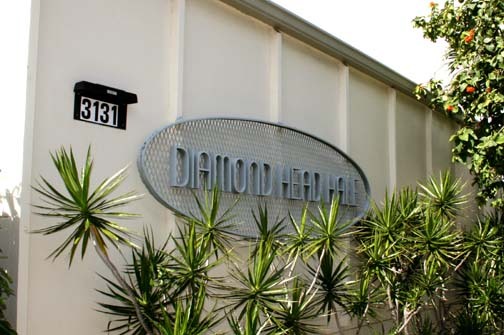 Diamond Head Hale is located at 3131 Pualei Circle. Take Leahi Avenue and make the turn into Pualei Circle to visit Diamond Head Hale.